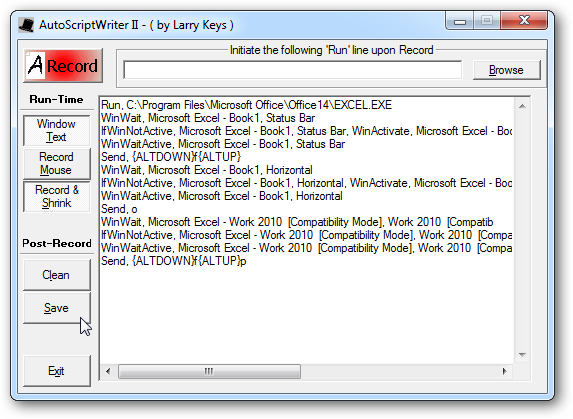 Record keystrokes automatically using AutoScriptWriter. Anyone who’s taken advantage of their office application’s macro function will realise just how useful a tool it is: suddenly, instead of having to perform several repetitive tasks or mouse clicks over and over again, you can record those keystrokes or mouse clicks, then “play” them back with a single click or keystroke, saving you time and effort in the process. The only problem with macros is that they’re limited to Office, so what can you do if you’d like to extend this functionality to another program – or across Windows as a whole? The solution lies a program called AutoHotkey. This allows you to create scripts that can automate not just common commands like launching programs, but also mouse clicks and keystrokes. It can also be used as an auto-text tool, to create customised entry forms, dialogue boxes and menu bars, and remap keys and buttons on mice and joysticks for good measure. Scripting for most of these is done by hand in AutoHotkey’s editor, but mouse and keystrokes can also be recorded using the supplied macro recorder (AutoScriptWriter), just like in Office. We’ve found it’s more effective to record keystrokes rather than rely on mouse clicks as these are based on the mouse’s position on the screen, which means they won’t work if a dialogue box or program window is resized or moved. A powerful tool with many uses - even relatively inexperienced users will find the macro recorder a useful way to automate a repetitive series of clicks or keystrokes.